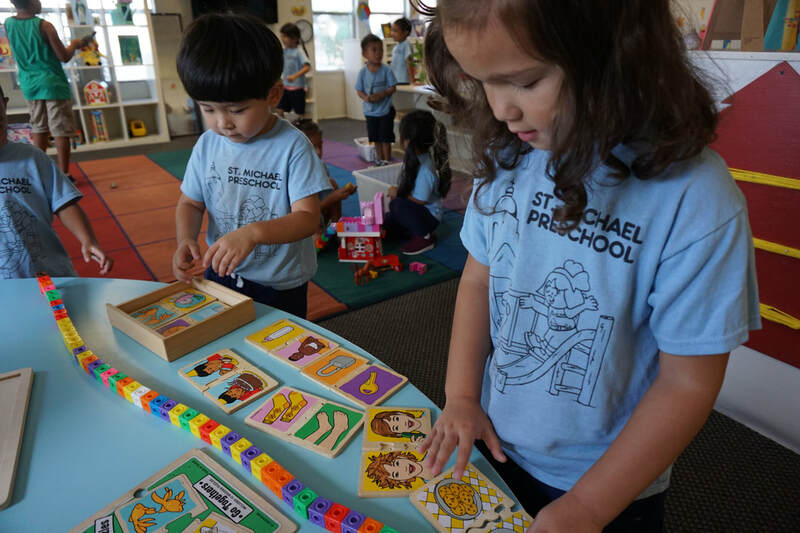 St. Michael Academy Preschool Curriculum encompasses many areas. This system of human growth for education provides opportunities for students to learn how to think and manage their own lives with increased ability and confidence. We give each student the opportunity to experience God through exploring, learning, touching, socializing, singing, sharing, and just having fun through the wonders of His creations. Religion is the most important part of our being here. We offer every opportunity to instill God's love in each student, and to teach him or her to love others as well. Through Bible stories, religious songs, projects, by-yearly religious performances and daily walks to actually see God's creations (trees, animals, sky, sun, etc. ), our students will know they are truly special children of God. Our students join the Academy students weekly in Church, officiated by our priest - together we will pray, learn about God and sing praises to Him. We are fortunate to have surprise visits from our Priest and, at these times, they may join us for special meals, prayers and a blessing. Spanish is introduced daily during Circle times through stories, conversation, etc. We also are able to assist the English as a Second Language ("ESL") student by encouraging them to speak English.